The Catacombs of Paris: A huge subterranean tunnel network located underneath the city of Paris, France. Beginning in 1785, Paris' overpopulated cemeteries were exhumed and millions of bodies were transferred to the Catacombs. The Catacombs' quarries, caves, and tunnels stretch over 300 kilometers (186 miles). The Catacombs are full of monumental tablets and archways bearing inscriptions. Black lines were painted on the ceiling to help people find their way out. The remains of over six million people line the walls of the world's largest underground ossuary. On February 19, 2016, PRISM Founder, David Pierce Rodriguez, investigated the notoriously haunted Paris Catacombs. 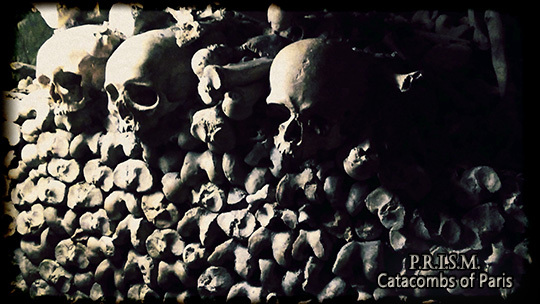 Several solo EVP sessions were carried out in the catacombs using a Panasonic RR-DR60 digital audio recorder. Electronic Voice Phenomena (EVP) is communication by spirits through digital audio recorders or other electronic devices. An Ovilus III ITC Research Device was used as well for further spirit interaction.